You know what inclusion means. It means the act of being included. What it also means? A practice of ensuring that people in organisations feel that they belong. When I was invited to be a part of Write Tribe, a support-system managed by Corinne Rodrigues to provide motivation and guidance for those in their salad days of blogging, I rejoiced. I was green and I needed ripening, gradually but urgently. This inclusion in an exclusive support group meant I could hold some hands now and learn to be a better blogger. Then, the second kind of inclusion happened. I was not just a part of the handful, but I was also made to feel at home amongst writers who I aspired to be. I was read extensively, and was taught how reading others is essential to growing as a writer. How appreciating was as important as getting appreciated. My technologically-dim cells never stressed over HTML hurdles and as I shared posts which had touched me, I picked up something new, something beautiful and something inspiring each passing day. This Christmas, I got a gift. 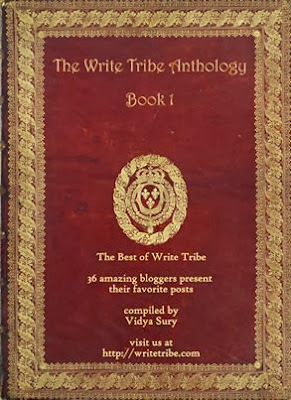 For the first time I was one among 36 to be published in an e-Book called ‘The Write Tribe Anthology’, compiled by Vidya Sury, for no lesser reason but that she wanted to give further and share further love that she abundantly carries within. Christmas is long gone, but the cheer is here to stay. On page 66 is a part of me, a handful of paragraphs but an opinion I carry etched on the walls of my mind, and heart. My post ‘Fresh and Tasty Home-made Feminism. Anyone?’ sits there. Proud is what I feel, considering the masterpieces which surround it – from meaningful poetry to rib-tickling humour, excellent pieces of fiction to endearing letters, inspiring posts to those which strike a philosophical chord. It’s all in here, where I was included to be, and made to belong. Turn these leaves and experience them. You may click on the image below to download your free copy. Sakshi this was an amazing post and I'm glad to connect with such an awesome writer courtesy WT! This cheer and this wonderful feeling of being published for the first time is definitely here to stay! And I loved your recipe of feminism girl! You made my heart dance with glee, Aditi. Thank you, and big hug for reading and liking my featured post. You made my day! Lots of love! ‘The Write Tribe Anthology’ is special, but your post makes it even more special! Congratulations Sakshi :) Way to go girl..
That's wonderful. It's great to be in a group of people with similar likes but different dimensions.